Walking into a Baskin Robbins, one is faced with many difficult decisions. After all, there are 31 flavors laid out in front of you (or at least there’s supposed to be). Rocky Road or Mint Chocolate Chip? World Class Chocolate or Jamoca Almond Fudge? Chocolate or Vanilla? Many people walk in, completely clueless as to what flavor they’ll be walking out with. Sometimes it takes a few taste tests; sometimes you decide based on whichever one looks most appetizing at the time. Baskin Robbins has something for everyone. From the simple layman who just wants a basic flavor, to the more advanced ice cream connoisseurs who want the works, Baskin Robbins can please them all. If someone gets a scoop of chocolate and then decides that it’s too plain, what are the options? Toppings, of course! You can customize your ice cream. You can add delicious hot fudge, rainbow sprinkles, or even nuts (if that’s how you roll). Baskin Robbins caters to all types. Now I ask you, what makes Android so special? Is it the fact that Googlers developed it? Trust me, that helps. How about its open source-ness (yes, in my posts I get to make up words)? We’re getting warmer. Maybe it’s the funny looking little alien creatures that accompany it wherever it goes? Heck yeah! I love those cool lil guys… but still not it. Sure, these things are all important. But I don’t think they’ll be the things that mold Android into the most successful phone OS of all time. 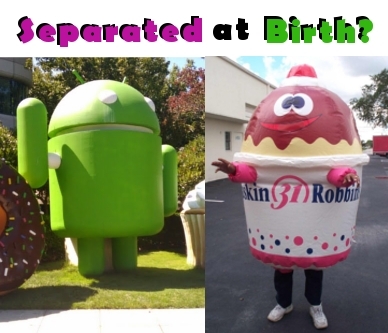 Android will dominate the smartphone industry in the coming years, and the reason is simple… just like Baskin Robins, it too comes in many flavors. Android, at its core, is the same OS. It doesn’t matter how you skin it, it’s still Android. The main code is constantly being updated with newer and greater functionality, courtesy of Google. For a company that has customized their build of Android, updating it shouldn’t be that daunting of a task, especially considering that each new build is only incrementally better than the previous. They just take the new build and slap their customization right on top. So far, Android comes in four primary flavors. We have Google’s standard interface, HTC’s Sense, Sony Ericsson’s Rachael, and Motorla’s Motoblur. (I’m not getting into slightly tweaked versions (like Huawei’s Pulse), as those don’t present the same level of aesthetic overhaul.) Flavors. Each interface presents a fresh feel for Android. Sometimes, you can’t even recognize Android below all the modifications. This allows Android to be more than just Android. It allows it to be many different OSes. The iPhone (dare I utter such a word on an Android website), only comes in one flavor. Even jailbreaking it doesn’t hide the fact that it’s still an iPhone, as it will always look and feel, for the most part, the same. Android is unique. You can sit an HTC phone and a Sony Ericsson phone side by side and you may never know they are running the same OS. That’s an amazing thing. If all phone manufacturers would take Android and create custom builds, the world would still be full of choices (as it is now), but it could all be managed by a single source code. This would alleviate many headaches for developers (for both phones and apps), and still give people what they want… choice. And let’s not forget toppings. If a customer wants the extras, all they have to do is head over to the Android Market or start modding. Android is whatever you want it to be, and that’s why it will, one day, dominate the smartphone market. Now, if only Baskin Robbins could figure out how to make all their flavors out of one… Hmmm. Which flavor of Android do you find most appetizing?